The grand opening of a new building for the Aspen Art Museum won't take place until the weekend, but one of the facility's inaugural stunts is already catching a lot of attention - not for being artful, but for being allegedly abusive. 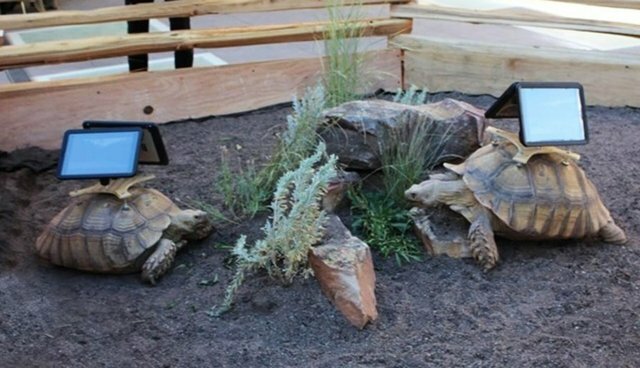 As part of an exhibition by artist Cai Guo-Qiang, called "Moving Ghost Town," three African tortoises will be made to stroll throughout the museum carrying iPads affixed to their shells. The screens will replay footage that had been captured by cameras attached to the tortoises as they walked through abandoned towns in Colorado. While the concept of using these animals as living displays for the sake of art might sound innocuous enough, to folks like Lisabeth Oden, who has spent time rehabilitating tortoises, it's far more harmful than most people realize. "I normally don't stick my nose out in public like this - by any sense of the imagination," Oden told the Aspen Daily News. "But to me this is just flat-out animal abuse." Not only does the exhibition exploit the tortoises, Oden as suggests, but forcing them to carry heavy objects on their shells for long periods of time can cause them to actually suffer. "These creatures were not designed to carry 2-pound iPads," she says, adding that, although tortoise shells seem durable, they are as sensitive to the animals as our skin is to us. Oden is not alone in her outrage. She has since launched a petition calling for the museum to reconsider the exhibition, and so far, more than a thousand others have added their signatures. According the museum's website, the tortoises will "closely monitored, cared for" until the exhibition closes in October, at which point the animals will be relocated to conservation and education facilities.